Measurements: 3.35 x 4.73 inches, or 85 x 120 mm. Wide. Back of card: Rich blue field. In the center, two urns, bottom to bottom. From each, nine lotus blossoms, one in full bloom, the remainder in various stages, all done in yellow & orange. May be inverted. Booklet included: Yes, 48 pages, 3.17 x 4.4 inches, or 80 x 112 mm. Text by Sungkom Horharin. Comments: According to notes by the creator of this deck, Sungkom Horharin, as recently as 1986, there was no tarot in Thailand. 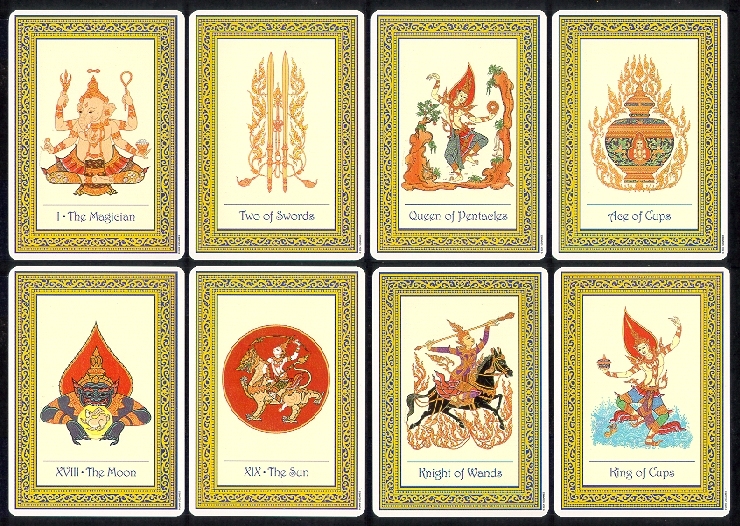 He himself claims to be the first tarot reader, and this the first Thai tarot deck. It is a striking deck. It is expressly made for fortune-telling, which the Thais seem to take much more seriously than we do.